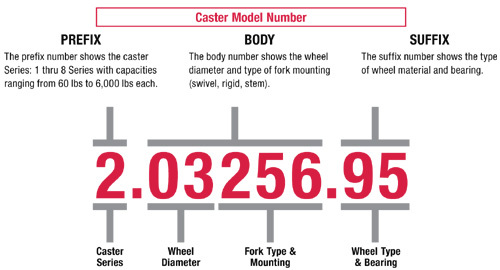 The illustrated Caster Model Number is a 2 Series caster with a swivel top plate fork and polyurethane tread (HI-TECH). Note: The replacement fork model number is the same as illustrated, except the wheel suffix is not included (for example, 2.03256). The illustrated Wheel Model Number is a 2 Series wheel with a diameter of 3-1/2″, made with polyurethane tread and ball bearing. 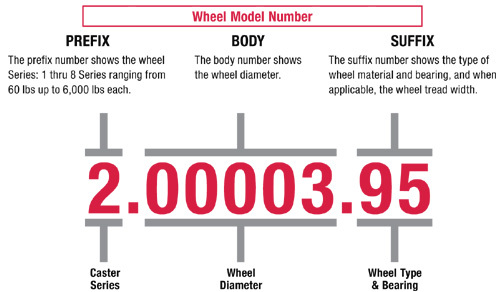 Note: The diameter code is usually, but not always, the diameter of the wheel (for example, the diameter code “3” could denote 3″, 3-1/4″ or 3-1/2″ wheels). Please check wheel charts for actual diameter of wheel.